The RALL-E project is investigating how to design simulation-based learning experiences for language learning that optimize learner motivation and promote conversational skills. We are doing this by developing a prototype lifelike robot that engages in conversations in foreign language, then studying its use in educational settings. Previously Alelo’s simulated conversation technology has been implemented in virtual characters in virtual simulations, which interact with learners using a combination of speech input and conventional graphical user interfaces. 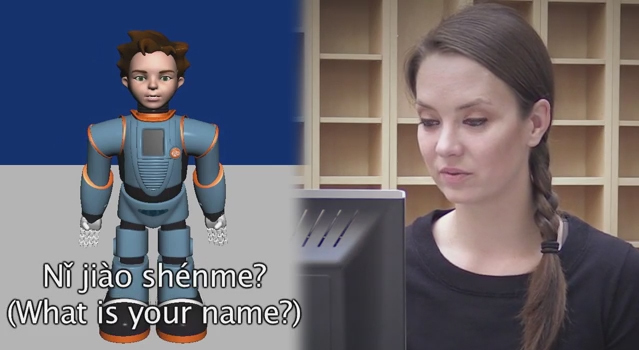 Lifelike robots can simulate face-to-face communication in a more natural way. We predict that a robotic interface will be more natural and engaging, which will result in improved learner motivation and learning outcomes. We also expect that exploring alternative modalities for social simulations will help us draw general lessons about how to make social simulations more effective as learning tools. How well are members of the target population able to engage in conversation in Chinese with the technology? Q1. What characteristics of the technology are most important for promoting conversational practice and mastery of the target communicative skills? Q2: How well can learners converse in the target language and task context, after the learning activities? Q3.1: To what extent are learners motivated to use the technology in classroom settings to develop conversational skills? Q3.2: To what extent are learners motivated to use the technology outside of the classroom? 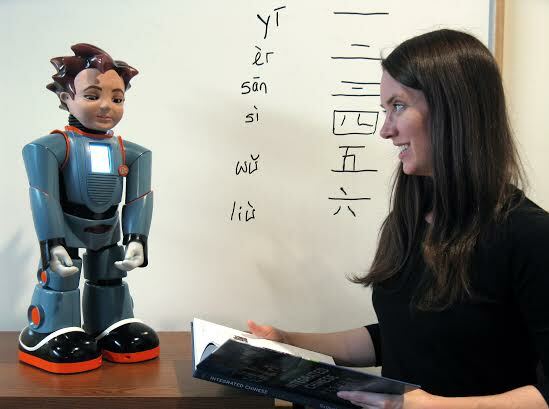 Q3.3: How does interaction with the robot affect learners’ motivation to speak Chinese? Q3.4: How does interaction with the robot affect learners’ anxiety about speaking Chinese? Alelo is industry leading training technology coupled with knowledge and expertise to synthesize solutions to any business, educational, or governmental communications training needs. The Hawaiian word for tongue or language is “Alelo.” We were conceived out of the recognition that effective communication transcends the verbal variety, and the realization that innovative technology can teach it effectively and efficiently. RoboKind is the world leader in humanoid social robotics. We design and build robots with advanced capabilities that enable people to engage with robots personally and socially. Our advanced social robots are purpose-built for autism intervention, special education, STEM instruction, and university research. We can deliver full courseware and therapies created by subject matter experts, and include appropriate interaction for both verbal and non-verbal learners. Most robotics companies create robots that just move and perform functions. Our robots, however, are created to be more humanistic with unparalleled technology that produces the most lifelike robots in the world. RoboKind robots feature the ability to walk, talk, teach, and think while using life-like facial expressions and natural social interactions. Virginia state government agencies – including VDOE – develop and implement Strategic Plans for the agency, relevant programs and service areas and identify Performance Measures to track progress in achieving the strategic plan objectives. Established in 1985, Thomas Jefferson High School for Science and Technology (TJHSST) is the result of a partnership of businesses and schools created to improve education in science, mathematics, and technology. Representatives from business and industry and staff of the Fairfax County Public Schools worked together in curriculum and facilities development for the school. We developed an initial working prototype robot-assisted language learning system in Chinese, integrating Alelo’s and Robokind’s technologies. This effort resulted in a working prototype that we could use in focus-group tests with high school students at Thomas Jefferson High School for Science and Technology in Alexandria, Virginia. We conducted a focus group test of the initial prototype in May 2014. The results of the focus group provided preliminary validation of the research questions, and provided useful student feedback for how to prioritize future development. For our first study, we invited a small group of beginning Chinese high school students to interact with our initial version of the dialog robot, play with a functional simulation of RALL-E, and play through an Alelo-developed online language course on the Virtual Virginia Online School (VVOS). After they were introduced to the VVOS course and RALL_E, they were asked to evaluate the two language learning methods and give their feedback on features they’d like to see in RALL-E.
June 2014: Keynote presentation at the International Conference on Intelligent Tutoring Systems.